Smoked fish is a delicacy loved by many. For taste and aroma it is valued all over the world. Do not stop foodies and information about the dangers of smoked meat for health. 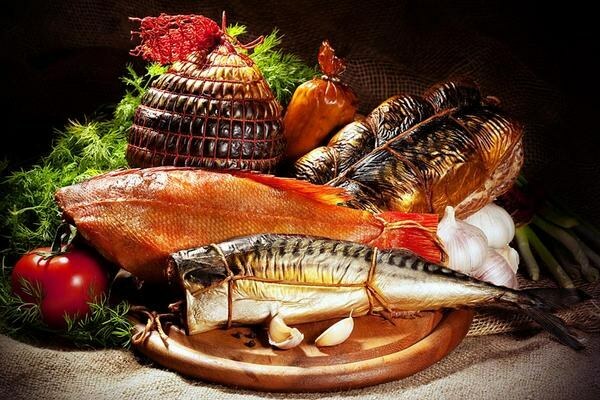 Around the theme of effects of smoked fish on the body there is a lot of debate. Smoking has long been known method of preserving food fresh. Nowadays, such treatment often aims to give the fish a new taste. It is important to know which methods of Smoking are different, and this affects the final product. So, during cold Smoking pre-salted fish processed by Smoking substances. Steam temperature does not rise above 20-25C. This kind of Smoking is very long - it often takes up to several days. However, in the case of cold Smoking is possible to speak about the relative harmlessness ready fish. When Smoking hot smoke temperature, which is processed fish, can reach 120C. For this reason, the delicacy is ready to eat very quickly - within a few hours. But the fee for speedy and simple enough preparation high with fish, smoked with hot smoke contains more harmful carcinogens. In the smoke, which is processed fish contains about a thousand chemicals. The most dangerous of these is benzpyrene. Smoking "liquid smoke" is another danger. In fact, this is not a Smoking product, but only its coloring and flavoring chemicals. Fraudulent sellers often employ this method of Smoking, as it allows them to significantly reduce the cost of production. In the "liquid smoke" in a huge number contains toxic phenol, seriously undermining health. In Europe there are clear standards that regulate the allowable concentration and dose of food additives. There you will meet low quality of smoked fish is much more complicated. Finally, it is often chosen for Smoking the fish, and the violation of the rules of Smoking can lead to the fact that the finished product will remain parasites or bacteria. And, of course, smoked fish contains a lot of salt, especially harmful to have kidney problems, children and pregnant women. Any Smoking adds to the fish extra fats, unlike, for example, frying. In the finished delicacy contains only the most valuable fish oil in its original state. In addition, fish is extremely rich in beneficial amino acids, vitamins E, a And D. Fish (especially sea) helps to replenish microelements, it is rich in iodine, calcium, and magnesium. All these substances partially, but is stored in the product prepared by the method of Smoking. To get from sea or river smoked fish maximum benefit, it's important to know that most valuable items are saved in fish, cold smoked method. On the contrary, the delicacy smoked most of the carcinogens. With the majority of the dangerous chemical compounds contains the skin of the fish. Have thin-skinned species (herring, mackerel, capelin) harmful substances in the smoke can easily penetrate through the skin. It is better to give preference to the cold-smoked fish that has thick skin, so the damage to the body is minimized, and the benefit maximum.